If you live in Maryland, it is probably safe to say you have seen a Bay Plate before. You know, the ones that are blue and yellow with the heron and the crab on it? (insert picture) Yes, that one! 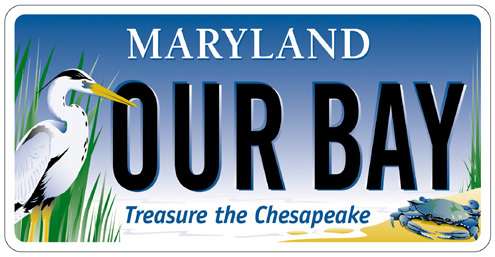 Well as you can imagine, the majority of Maryland drivers who have a Bay Plate have bought one because they liked the way it looked or wanted to show their appreciation for the Chesapeake Bay. These are both great reasons why someone should buy a Bay Plate, but we can give you a few more. For $20, the MVA (or your car dealer) will provide you with a Treasure the Chesapeake license plate that not only looks pretty great but also provides a donation to the Chesapeake Bay Trust, a nonprofit organization that works to improve the Chesapeake Bay in Maryland. Last year more than 50,000 Marylanders bought a Bay Plate, and as a result, the Trust awarded $5 million in grants to make a difference in your neighborhoods, for your children and our Bay. You also don’t have to wait to buy a plate when you get a car—you can do it anytime online at bayplate.org and the MVA will send you your new tags in the mail! So check it out when you have a second, and find out how little it takes to do a great thing for the Chesapeake Bay. What will just a couple of license plates accomplish?